One of the most iconic sitcoms of the 1980s, Growing Pains debuted on September 24, 1985. The show ran for seven seasons and 166 episodes on ABC. 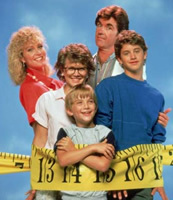 It told the story of the Seavers: psychologist Jason (Alan Thicke) and reporter Maggie (Joanna Kerns) and their children, Brainy Carol (Tracey Gold), troublemaker Mike (Kirk Cameron), and ever-hungry Ben (Jeremy Miller). As the kids grew up and ratings started to decline, a new daughter Chrissy (Ashley Johnson) and homeless teen Luke Brower (Leonardo DiCaprio) were added. The series closed on April 25, 1992 with the family selling their house and recalling past events. The family reunited on November 5, 2000 for The Growing Pains Movie as part of The Wonderful World of Disney. Eight years have passed since the family sold their house and Maggie and Jason are living and working in Washington DC. The three older kids are out on their own, Chrissy is a film student, and… well, if you’re curious, you can watch the video for yourself. Stay tuned!